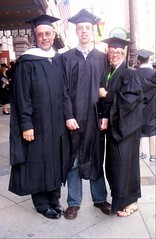 The three of us in our caps and gowns, out on Broad Street in front of the Merriam Theater after the ceremony. This entry was posted on Thursday, May 18th, 2006 at 8:33 am and is filed under Uncategorized. You can follow any responses to this entry through the RSS 2.0 feed. You can leave a response, or trackback from your own site. The Sun! It’s shining from your beaming son. Congratulaitons, Alex, on the new threads. A Vespa must be in your future.